Solar Just Hit a Record Low Price In the U.S. Even Donald Trump’s solar tariffs and desire to prop up the coal industry can’t stop renewable energy. A solar auction in Nevada just yielded the cheapest solar project in the country. It broke a record that was set [checks calendar] last week. Not only that, the price the plant will operate at is cheaper than new natural gas and coal plants. While the sunny weather in Nevada and federal tax credits certainly play a role, it’s also part of a clear trend of solar power becoming cost-competitive with and even starting to beat fossil fuels. 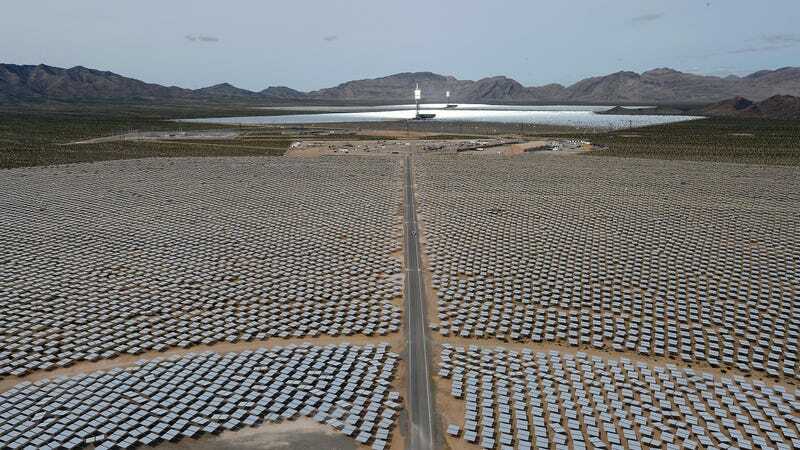 The price and size of the plant handily beats the cheapest confirmed solar project in the country, a title that formerly belonged to a piddly 30 megawatt farm in Arizona that was part of an effort to replace the aging Navajo Generating Station (some tribal members aren’t happy). That project was auctioned for the low, low price of $24.99 per megawatt-hour over the duration of its 20-year contract. The Nevada auction also included a number of projects that link up utility-scale solar with batteries. Mastering solar plus storage will be critical for renewables to truly overtake fossil fuels, since they only generate power when it’s sunny or when the wind blows. All these projects have one important have one important factor in common: being located in the sunny Southwest. That geography absolutely plays a role in keeping prices low. But increasingly efficient technology also helps, and Naam said these prices are a bellwether of what’s to come in the next few years in places like Texas, California, and Colorado. And they haven’t slowed solar deployments yet. A report released by the Solar Energy Industries Association on Tuesday revealed that 55 percent of all U.S. electricity generating capacity installed in the first quarter of 2018 was solar. A whopping 2.5 gigawatts of solar was added, marking the 10th straight quarter where more than 2 gigawatts of capacity added. The report also noted that total installed capacity could double in the next five years. All this is good news, but the transition away from fossil fuels towards renewables needs to happen even faster to avoid the worst impacts of climate change.